With Transifex Live, you’re able to publish translations (take translations live) at any time and make them available to your visitors without needing your engineering team to deploy anything. Administrators and Project maintainers are the ones who can publish translations. Click Publish in the Transifex Live sidebar to open up the Publish panel. 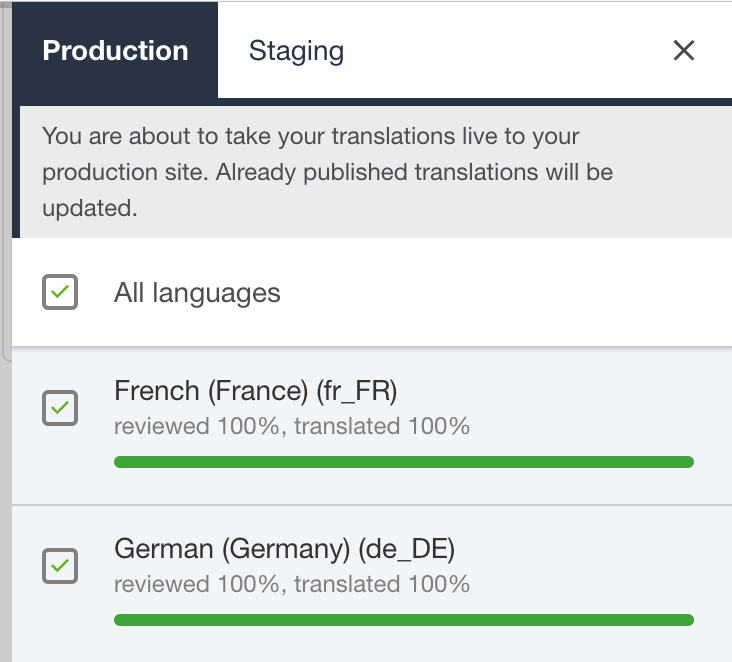 Choose whether you want to publish translations to your production (live) site or staging site by clicking on the corresponding tab at the top. Select which language(s) you’d like to take live. At the bottom, choose whether you want publish all translations, or only reviewed translations. Hit Publish to production or Publish to staging. If you choose to publish only reviewed translations, make sure that your translations are marked as reviewed. Otherwise, if they are left as translated but unreviewed, they will not be served on your website; instead, the original English source will be available. Your translations will typically be visible on your site in under a minute or less. 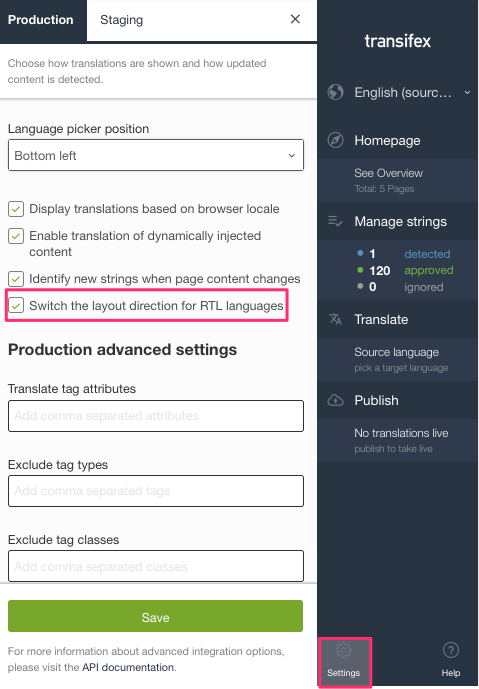 To update translations or add additional languages to your site, repeat the steps above. It’s important to note that each time you hit publish, you should check all the languages you want to show to your visitors. For example, if you initially published French and German translations, then added Spanish translations, you should have all three languages checked when you launch Spanish or update translations for any those languages. To unpublish a language, uncheck it and then publish to your production or staging site again. 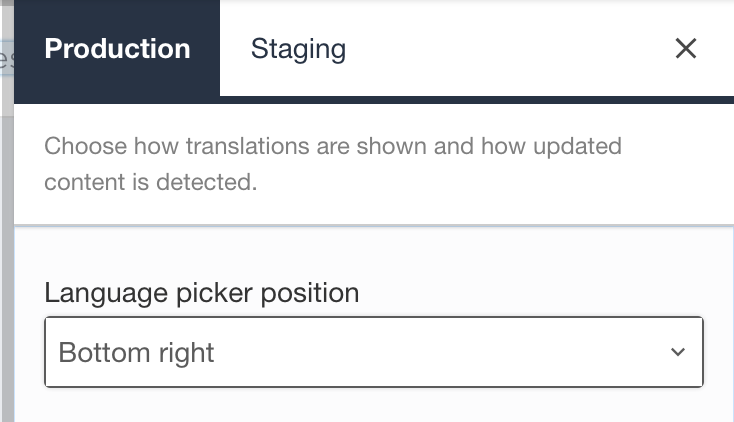 You can change the location of the picker by going to Settings in the sidebar and selecting a different language picker position for your production and staging sites. If you’d like to customize the location and appearance of the language picker, you can do so by following the instructions here. If you are translating your website into languages that read from right to left (RTL), you can set Transifex Live to display those languages properly for your RTL visitors. From the Transifex Live sidebar, click on Settings at the bottom. 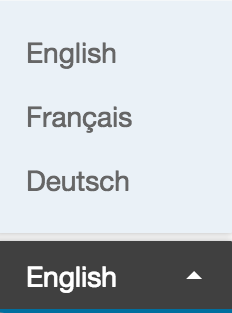 Check the box next to Switch the layout direction for RTL languages. Click Save in order to apply the changes. When you publish translations, your translation text is uploaded to our Content Delivery Network (CDN) hosted on Amazon Web Services, then served to your visitors when they come to your site. Using a CDN ensures both high uptime and low latency. One important benefit to using Transifex Live (versus a proxy solution for example) is that our CDN only serves the translated text, not your site itself. This means you don’t give up control of your site to a third party, and sensitive information like credit card numbers never pass through our servers.